Facebook has a real focus on video right now, and has today introduced the ability to create looping videos - which is basically like a GIF - to use as your profile 'picture'. "Soon, you'll be able to film a short, looping video clip that will play for anyone who visits your profile," the company said in its announcement. You can take the video, which lasts about 7 seconds, through the Facebook mobile app. The video will play in a silent loop until you click (or tap) it and it actually reminds us of the moving photos from the Harry Potter movies. Facebook is also letting you add "temporary version of your profile picture" which will revert back to your usual profile picture after a specified time. Examples include a temporary image while you're on vacation, or supporting a sports team for the big game over the weekend in what Facebook is calling "a visual status update." The social media giant is also giving users better control, allowing you to customize the information shown at the top of your profile page on mobile, including choosing up to five Featured Photos. It's also added a new 'Bio' field, which is one sentence long and is similar to the bio field in Twitter and Instagram. Photos and videos are also getting featured more prominently on mobile, with profile pictures to be centered and made bigger, and photos and friends to be place right at the top of profiles as well. 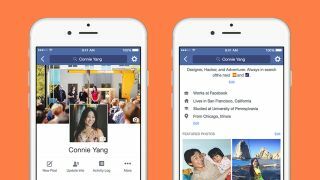 Facebook says the new features will be available to a small group of iPhone users in the UK and California, and will be rolled out to more users soon.